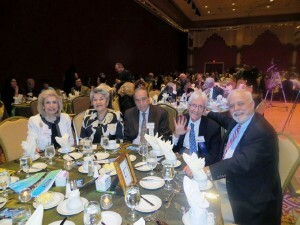 Important topics concerning the growth of Modern Greek language programs were debated at the Prometheus Greek Teachers Association and Federation of Hellenic-American Educators workshop on Saturday, April 13th, at the Trump Taj Mahal Hotel and Resort in Atlantic City, New Jersey. Educator Vasiliki Filiotis, President of Prometheus, Stella Kokolis, President of the Federation of Hellenic American Educators, Timoleon Kokkinos, Dr. Aristotle Michopoulos. Director of Greek Studies, Hellenic College, former Prometheus President John Markopoulos, at gala. The decline in the enrollment of students in Greek schools in North America’s Hellenic communities were discussed. Ways to overcome this problem were presented in the workshop. It was suggested that an establishment of Hellenic Studies programs within North American universities should be established to prepare future instructors of the Greek language and culture. Mrs. Stella Kokolis, workshop moderator and President of the Federation of Hellenic American Teachers and the World Council of Hellenes Abroad (SAE) Education Committee for the US region, said “there is a need for an improved cooperative effort among educators. The Prometheus Greek Teachers Association and Federation of Hellenic-American Educator Workshop and delegation included parents, community leaders and activists. They are the following persons: Eleni Karageorgiou, Education Counselor of the Greek Consulate, New York; Stella Kokolis, President of the Federation of Hellenic American Educators; Educator Vasiliki Filiotis, President of Prometheus; Dr. John and Emily Antonopoulos; Dr. Aristotle Michopoulos. Director of Greek Studies, Hellenic College; Dr. George Melikokis; Timoleon Kokkinos; Yannis Markopoulos; Dr. James G. Faller; Dr. Dean Lomis; Dr. Marianthi Molfetas; Dr. Despina Siolas; Demi Savopoulos, President of HAEA; Dimitri and Stavros Papaloizos; Lefteris Karmiris, President and Anna Papageorgiou of Prometheus, Washington, D.C.; Helen Pylarinos Fotiou; George Fotiou; Marianthi Raptis; Despina Stavrou; Paul Sapounakis; Manos Lambidis; Anastasia Korfiatis; Grigoris Stamoulis; Katerina Klein; Eleni Koumas; Maria Carvelas; Vicki Palma; Pandora Spelios; Vasiliki Stasinopoulos; Mrs. Mancini; Maria Paloumbis; Tony Alexis, Angie Yanas: parents and students. Honoree Helen Pylarinos Fotiou is the founder of the Alumni Organization of the Graduate Teachers of St. Basil’s Academy and Hellenic College. Her education career began in 1973. Her greatest joy is to meet former students. Her son, Konstantinos C. Fotiou, who can be reached at fotiouk@yahoo.com, creates medical websites. Eleni Koumas, 2013 Hermes International Expo Honoree, has been teaching since 1978 in the New York City public school system. Her exceptional education career was recognized by the Greek government in 1992, New York City Public School System and numerous education organizations. She was Assistant Principal Interim acting in 2000 at P.S. 111 Queens. Educator Koumas is seriously considering publishing a children’s book on Greek Independence entitled “To Kryfo Skolio” (The Secret School). Vasiliki Filiotis expressed “special appreciation and thanks to former Prometheus President John Markopoulos, Pan Gregorian leaders Peter Tsagarakis President of Upper New York, George Siamboulis, Tony Mpletakis and Anastasios Manessis for their continuous support of Modern Greek Studies; members of Prometheus Greek Teachers Association and Federation of Hellenic-American Educators, Mr. Paul Kotrotsios, Hermes International Expo staff, educators, parents and youth who participated in seminar and dinner. Every year we look forward in attending and honoring educators and students. We congratulate the honorees of the 22nd Hermes International Expo. Mrs. Stella Kokolis, President of the Federation of Hellenic American Teachers, is commended for her unique effort, as well as, all participants at Hermes International Expo 2013.